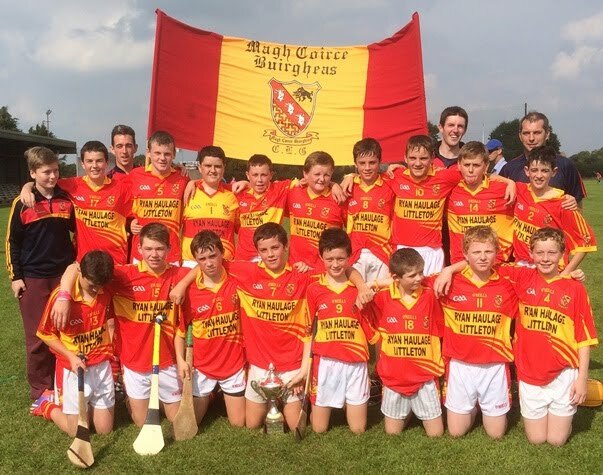 In midsummer like weather the sun shone down in abundance in Boherlahan for the staging of both the U 14 A & C Hurling County finals.Mid champions Moycarkey Borris were making club history in contesting a county double. The action opened at 1.30pm with the C contest between south champions St. Patricks and Moycarkey Borris. This curtain raiser was an epic encounter with two very evenly balanced contenders. St. Pats opened the scoring with a point from James Fitzgerald. The opening goal came in the third minute for Moycarkey with a fine strike by John Coffey. This was quickly responded too with another St. Pats point from a free by Frank Meagher who was in a commanding form from midfield inwards. Moments later Daniel Brown pointed from play to increase the Moycarkey advantage. The spectators were being served up a very lively and exciting dual with some brilliant displays from both teams in attack and defensive areas. Both goal keepers were being tested and duly delivered. Two frees conceded quick succession by Moycarkey which St Pats marksman Frank Meagher converted had the sides’ level for the second time after twelve minutes Moycarkey 1-1 St Pats 0-4. Both sides let their next scoring opportunities go begging and certain goals were on offer but as earlier mentioned both goal keepers were on red alert mode. However the stalemate came to end on the twenty first minute when Moycarkey regained a one point lead from a converted free by Aidan Scott and indeed could have made two more additions to the score board as they saw two chances tailing off target. The interval score read Moycarkey Borris 1-2 St.Patricks 0-4. It was St Patricks turn to enjoy the advantage of the slight breeze and right from the off this appeared to be occurring as they showed to be much more purposeful in their play. From the commencement Frank Meagher pointed a free to level matters for the second time. Captain Conor Duggan quickly added another pointing from play. Moments later both Frank Meagher and captain Duggan adding a point each to bring their teams total to 0-8 while holding off the Moycarkey attack to go ahead for the first time since the opening minute of the game on a score reading St. Patricks 0-8 Moycarkey 1-2. On the fifteenth minute Daniel Brown pointed a free to reduce the Moycarkey defecit. Seconds later St. Pats responded with a pointed free by Frank Meagher to hold a three point advantage. Another chance of extending the lead tailed narrowly wide. With five minutes remaining the Moycarkey boys made an attack which yielded a goal by Aidan Scott to put the sides level for the third 2-3 to 0-9. A minute later the Mid boys had the net rattled for a third goal by Ben O’Dwyer to put Moycarkey up 3-3 to 0-9. Two more chances from 65's went off target as Moycarkey were in top flight. St Patricks attacked with Dale Murphy getting a long range point to reduce the difference to two points. They made one final attack on goal but the time had run out on their chance and it was heart breaking for the south followers who had seen victory snatched from them in the dying moments of a half that they had enjoyed supremacy. For Moycarkey it was scenes of jubilation as was heard by one of their supporters that it was a smash and grab finish. Full credit has to be accorded to both panel of players who served up a very honest and hard fought game of hurling. It was a sporting spectacle all the way through. It would be unjust to single out any group of players from either side as on every section of the pitch every player was giving their all. 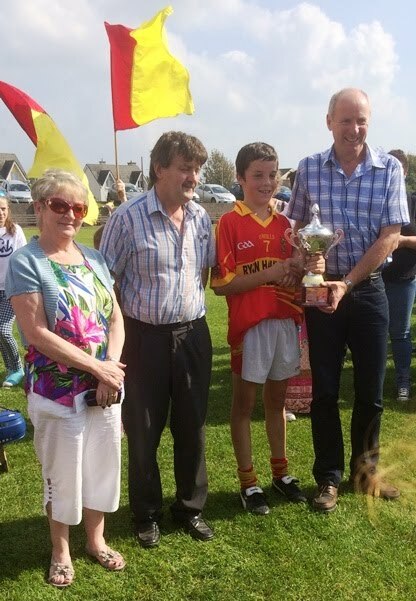 Chairman Joe Kennedy presented the Jacksie Ryan cup to victorious captain Bill Hackett. He acknowledged the services of referee Willie Kennedy and his officals. He thanked the Boherlahan Dualla club for having the field in top shape.